Lionsgate releases Tyler Perry's Madea's Witness Protection nationwide on June 29th, 2012. NYC MOVIE GURU: Tyler, how did the idea of a Ponzi scheme in Madea’s Witness Protection come to you? Tyler Perry: I was sitting at dinner with a friend and they were saying that the best punishment for Bernie Madoff was to have him move in with Madea. I thought that was funny, so I started writing the movie, and that’s where the whole process started. I thought, “Who’s the best person that I can get to play someone close to this guy? “I thought, “Of course, Eugene Levy,” who does an amazing job. (laughs) So that’s where it all started for me. As far as the dynamic of drawing on my own experiences, I drew from my mother. God rest her soul, if we put her in a five star hotel, as we did once, or if you put her on an airplane and put her through security, you would have all of those scenes. If you put her at a dinner table with a bunch of white people, you would have a lot of things that we have in Madea’s Witness Protection. NYC MOVIE GURU: What are some of the funniest moments you while on set? Eugene Levy: For me, and I know for Denise [Richards], the funniest parts of the movie were being there for Tyler’s close-ups as Madea. When he isolates himself in a close-up, you do a scene, and that’s one thing. Everybody is doing the scene as scripted, more or less, because everyone’s got cues, and knows when to come in, and when not to come in, but when the camera goes in on a close-up, he just goes crazy. He just starts improvising and riffing in character. Romeo Miller: I’m definitely going to have to agree. That scene when we were trying to convince Madea to go to New York. I think I had to pinch myself not to laugh. Denise Richards: I didn’t want to screw up his coverage, so the three of us would look at each other, and then look away. We would start laughing. TP: And then I would start laughing. Doris Roberts: I had a wonderful time, because he wrote a character that had slight dementia, so that gave me the opportunity to be very naughty. The other thing was, we had this Jewish family going to church, and behaving as if we were black. Tom Arnold: I’d like to say one thing about Tyler as a director. You go into these things, and we didn’t know each other, and I wasn’t very familiar with his work. But I know who the star of the movie is, obviously. But I felt like he wanted at least me, and I’m sure everybody, after you do your take, he’ll stand next to the camera, egging you on. He wants you to come up with something better. It’s not about doing your lines. He’s literally cheering you. I thought that was a pretty amazing thing. You don’t see that often. Marla Gibbs: I love being anywhere now. I love being in this film because I think Tyler’s not only a great director, he’s also a spiritual person. He’s hired so many people, and he doesn’t hire just one persuasion. I think he understands that we’re all one. This represents us as one. It’s a wonderful cast, and it’s diversified, but underneath, we’re all one. We all had the same experiences and aspirations. NYC MOVIE GURU: John, given your background as a comedic actor, was it hard just to be a straight preacher? John Amos: It wasn’t much of a departure from some of the other serious roles I’ve had, like Percy Fitzwallace on ‘The West Wing.’ That was sort of a serious role. But I do a lot of stage work. I think stage is my favorite medium. I’ve apologized to Tyler because the only direction he gave me that I remember that was constructive criticism was that I was going to blow Romeo’s ears out. I was projecting a little bit too loud. I only had the one day, and we hadn’t established a chemistry that you might get if you’re there for a longer period. But this young man, Romeo, has one heck of a future in front of him. It’s always a joy for me to see younger talent coming along. NYC MOVIE GURU: What do you think are the basic elements that turn a comedy into a classic? EL: There are all kinds of successful comedies. You’ve got Airplane, you’ve got junk comedies, and they’re hysterical. But if you’re not emotionally involved in the characters, then the movie ends when the jokes stop. So for me, everything has to be grounded. The characters have to be grounded and the story has to be grounded in truth. If that happens to me, that’s the most successful kind of comedy. You can take your comedy as far as you want to take it. You can put the camera on yourself, and just go, but you’ve got to make sure that everything around those moments is rock solid, and are embedded in concrete, firmly, firmly grounded. Then, you feel for the characters, and you’re invested in the story, and to me, that’s the most successful kinds of comedy. 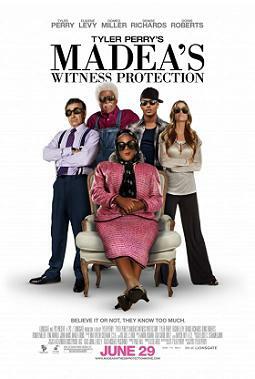 Madea's Witness Protection certainly has that. You can kind of go as far as you want comedically, but still the moments are kind of grounded in a truth. NYC MOVIE GURU: Tyler, between acting, directing and producing, is there one role you enjoy the most? Where do you go from here? TP:I don’t know where Madea goes from here. You know, I was thinking about having her go to the White House, and babysit Sasha and Malia. (laughs) See, you laugh, it sounds like a good movie, right? Whatever I’m doing at the time is what I enjoy the most, but if I’m acting, if I’m doing Madea, everyone on set is on pins and needles. The lighting, the director of photography, the grip, the gaffers, they’re all like, okay, he’s going to get dressed, let’s be ready. They know once I get in the costume, I want to take it off. I can not take it off fast enough, between the wig and the make-up. All of that stuff bothers me, but what I love about it is the end result. DR: You give something I don’t remember getting in the 50 years that I’ve been in the business, and that’s total respect. It’s extraordinary when you get that, because you’re loved, and you get his attention. You want to give the best you can. JA: Tyler has the talent to do that---to give respect to other actors. Plus, he’s developed a knack for delivering a message that’s uplifting and comical. That’s what separates you from the legions of wannabes.